. . .and the False Prophet and 10 kings downsized to 7 and. . .
"Some of the stars in this particular constellation are Denebola, which means 'The Judge,' 'The Lord Who Cometh Quickley'; Zosma, meaning 'The Shining Forth,' the 'Epiphany' (or manifestation, as when Christ shall come again); Minchair al Asad, meaning in Arabic 'The Punishing' or 'Tearing of Him who Lays Waste''; Al Defera, meaning 'The Putting Down of the Enemy.' Here indeed is a vivid picture of the wrath of the Lamb; the coming forth of Christ in final judgment and victory over His foes. Dr. Kennedy's knowledge of astrology and Egyptology are prominent throughout his book, The Real Meaning of the Zodiac. As well, he knows much (too much) about ancient sacred sites. We recall that Chuck Missler also has an unhealthy interest in sacred sites, such as the Tarxien temple which tourists on his Malta Expedition will visit in April, 2004. To elucidate the symbolism of the Sphinx, Dr. Kennedy refers to a 'sky painting' in an ancient Egyptian temple, discreetly omitting the fact that the Temple of Esneh is dedicated to the Egyptian creator-god, Chnum. "And so the Sphinx was invented as a memorial guide to the heavens. It had the head of a woman and the body and tail of a lion, to tell us where to start and stop. The word 'Sphinx' is from the Greek 'sphingo,' to join—because it binds together the story's two ends, making this circle of the heavens. "Confirmation of this is found in one of the oldest zodiacs, dating back to approximately the year 2000 B.C. This is the zodiac of Dendereh. It was discovered by scholars in the ceiling of the portico of the temple of Esneh in Egypt. In this zodiac there is placed between the signs of Virgo and Leo a picture of the Sphinx." Contrary to the false gospel in the stars, Virgo's position in the Zodiac has nothing at all to do with the Promised Seed of the Virgin Mary; rather the first sign of the Zodiac was Virgo/Isis, the sister-wife of Osiris, who was also known as Saturn, Tammuz and Nimrod and who was reincarnated in his son, Horus. Please recall that the dismemberment of Osiris represented the fragmenting of the different races, religions and cultures of humanity which Nimrod had attempted to unite (Gen.11). Isis' equivalent in Greek mythology was Rhea, the sister and wife of Cronus (the Roman Saturn) and the mother of Demeter (Rom. Ceres), Hades (Pluto), Hera (Juno), Hestia (Vesta), Poseidon (Neptune), and Zeus (Jupiter). "The Christian Stephen quotes these passages of Amos and connects it with the worship of the golden calf (bull or Taurus). His words on this are recorded in Acts 7:41. He further connects it in the next verse with the worship of 'the hosts of heaven'. In line with translations like the Septuagint, he states in verse 43 that Amos 5 refers to the cult 'of Moloch and the star of the god Rephan'. We turn now to Dr. Cathy Burns' book, Hidden Secrets of the Eastern Star. 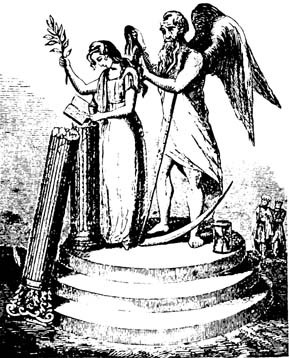 On page 150 is found a strange but well-known picture among occultists whose esoteric meaning, as interpreted by a Masonic source, is most informative. From the Masonic Short Talk Bulletin we learn that Leo, the final sign of the Zodiac, is Rhea's husband—Saturn or Chronos, the god of Time. "Mother of Darkness: 'Everything. This is the most secret thing. Saturn is the gateway. The point at which all thought is fixed. The point at which all feeling shall be projected as the eye opens. Much ritual and preparation has gone into the issuance through the gateway of the ancient ones. A strengthened invisible quintessence to hold them in this plane at the time of advent. "Interviewer: 'And what will be the result of this advent? What will it mean? Graham Hancock and Robert Bauval would have us believe that that the sickle of Saturn, i.e. Leo, is a question mark (?) and that Regulus is the lion's heart: "Leo resembles the animal after which it was named. A right triangle of stars outline the back legs...the front of the constellation, like a giant backward question mark, defines the head, mane and front legs. At the base of the question mark is Regulus, the heart of the lion..." (132:152) In his book on astrology, D. James Kennedy also refers to Regulus as the heart of Leo, the Lion. Regulus is a brilliant 1st magnitude star in the constellation of Leo. In his astrological handbook, Star Names: Their Lore and Meaning, Richard Hinckley Allen identifies Regulus as Leo's sickle. From these seemingly dissonant sources, we see that disinformation abounds not only in the New Age community but also in the Christian community, where pseudo-biblical astrologers are preparing the apostate Church for reception of the Antichrist as Jesus Christ wielding a scythe against His enemies. Whilst the strategy of Reformed Amillennialists such as D. James Kennedy is to deny the Tribulation period altogether, pseudo-Dispensationalists like J.R. Church mislead their readers through false interpretations of proper eschatology. A major objective of Dispensational false teachers, such as J.R. Church, is to eventually fool apostate Christendom that the mid-point of the Tribulation Period is the end of the Tribulation. Popular prophecy conferences provide a far-reaching platform for false prophecy teachers to pervert Dispensational truth through false interpretations. Multitudes of Christians are led into error through this scam. "Some remarkable conjunctions will occur in May of the year 2000 as all five major planets, along with the sun and moon, group together leaving the constellation, Aries, and entering Taurus around May 4. "Jupiter and Saturn will be extremely close as Venus has a conjunction with Jupiter on the morning of May 17 and with Saturn a few hours later, May 18. Jupiter and Saturn, the two largest planets in our Solar System, will meet a few days later on May 27. This is a remarkable series of events to occur in a single month. "Judah is a lion's whelp: from the prey, my son, thou art gone up: he stooped down, he couched as a lion, and as an old lion; who shall rouse him up? "The sceptre shall not depart from Judah, nor a lawgiver from between his feet, until Shiloh come; and unto him shall the gathering of the people be" (Genesis 49:8-10). "The Hebrew word used for 'his feet' reglaiv, is very close to the Latin, Regulus. We get the word regal and regulation from Regulus. The Hebrew regel (foot) appears to be so similar to the name of the star, we suspect a connection. Using various fronts posing as Christian ministries, the secret societies have used the Grand Planetary Alignment and Jupiter/Saturn conjunction in the year 2000 to mark the beginning of a false Tribulation Period. The rationale behind commencing a false Tribulation period before the genuine Tribulation starts is to ultimately deceive the apostate Christian masses with a false Antichrist, a false False Prophet, a false Mark of the Beast—a pseudo New World Order which will be overthrown by the real Antichrist posing as Jesus Christ. So when J.R. Church projects that August 29, 2007 is the end of the 7-year Tribulation period and the Second Coming of Jesus Christ, the reader can reasonably assume that this date may be the midpoint of the Tribulation when the Antichrist makes his grand entrance, per Revelation 13:1. The Pre-Tribulation Rapture of the true Church will be the event that God uses to begin the actual seven-year Tribulation Period. During the first 3 1/2 years of the real Tribulation, the secret societies will set up a false Antichrist, a false False Prophet, a false Dragon, a false Babylon the Great, false Mark of the Beast and many other counterfeit fulfillments of Bible prophecy. 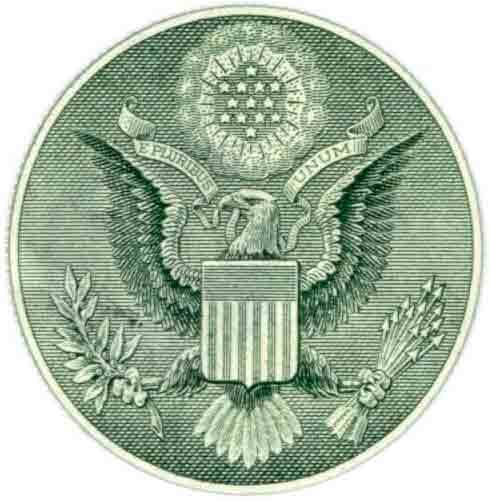 These counterfeits will function as decoys and scapegoats in order to (1) justify the elimination of established governments and traditional religions and (2) prevent recognition of the true Antichrist, the true False Prophet, true Mark of the Beast and Satan's gnostic religious system. At the midpoint of the Tribulation period, the real Antichrist and False Prophet will destroy the false Antichrist, the false False Prophet, the false Dragon which is Mystery Babylon the Great, the Roman Catholic Church. According to D. James Kennedy, the chief star of Leo, Regulus, will be the heavenly sign of 'Christ' when he tramples on His enemies. There is a hint in Kennedy's remarks that the mighty fall of Christendom will be connected with the discovery of the Hall of Records in the Lion's forepaw ('the lion's breast, whence its mighty paws proceed') with the result that 2,000 years of Christian dogma will be pronounced invalid. "Before getting into the events, I will give a review of the Biblical meanings of the constellation Leo (Arieh), the star Regulus, the planets Jupiter and Venus, and the Sun. "The constellation Leo (Arieh, the lion) represents not only Messiah crushing the enemy, but also the Tribe of Judah and the House of Judah. "The star Regulus in the constellation Leo (Arieh) is the brightest star in that constellation and the chief or king star (the king star of Yehudah). All ancient civilizations recognized Regulus as the king star, the one and only king star in the zodiac. Regulus means kingly in Latin. The Arabic word regel means foot and is identical in meaning to the Aramaic word regla and the Hebrew word regel. Thus the brightest star in the constellation of Arieh, has the Biblical connotation of the foot, tying in with the "from between his feet," of Genesis 49:10 ("the sceptre shall not depart from Judah, nor a lawgiver from between his feet, until Shiloh come; and unto him shall the gathering of the people be") represented by the king star, Regulus. The planet Jupiter or Tzedeq in Hebrew is the chief or king planet of all the planets. Its Hebrew name Tzedeq is the root of Melchizedek. Jupiter has long been recognized as a messianic star and associated with the Messiah. Tzedeq means righteousness. The Messiah who would come from David's genetic line was to be the righteous Branch, according to Jeremiah 23:5, who would reign as a king and execute righteousness. His name would be called the Lord our Righteousness (Jer. 23 5, 6 and Jer 33:15, 16). Thus Jupiter has characteristics that would associate it with the Messiah. Yahshua is made an high priest for ever after the order of Melchisedec (Heb. 6:20). "Venus is the bright and morning star. This is also associated with Yahshua HaMashiach, "the bright and morning star" in Rev. 22:16. August 17 – Sun and Venus in conjunction. August 21 – Jupiter and Venus in conjunction. August 22 – Venus and Regulus in conjunction. Sun and Jupiter in conjunction. August 23 – Sun and Regulus in conjunction. August 27 – Mars at its closest approach to Earth in the last 59,000 plus years. August 28 – Mars at opposition. "On July 16, 1994, which is the 9th of Av on the Hebrew Calendar, the twenty-one pieces of Shoemaker-Levi comet began its bombardment on the planet Jupiter. Jupiter is commonly recognized as a symbol of idolatry and paganism. One of the most devastating events in the history of Israel occurred when the image of Jupiter was placed in the Temple of God. We continue to observe the feast of Hanukkah as a celebration of the victory of the Maccabees in removing this pagan god from the temple and re-instituting temple worship. "It is clearly prophetically significant that the Shoemaker Levi comet began its assault on the planet Jupiter on this notable date. The Heavens declare the Glory of God. It is also significant that the comet was broken into twenty-one pieces also representing the twenty-one days extending from the 17th of Tammuz until the 9th of AV, the season which this prevailing spirit operates with its greatest authority. "Even though Jupiter is a symbol of idolatry for the pagan world, it is also a term for righteousness in the Hebrew language. The Hebrew name for Jupiter is Tzedeq and comes from the word meaning 'righteous' or 'righteous one'. It is from this term that the name Melchizedek is derived denoting 'King of Righteousness'. Using the Hebrew calendar to support an astrological false teaching, Bob Jones was claiming that the 1994 assault of Shoemaker-Levi on Jupiter symbolized a strategic attack by the powers of darkness on the Jesus Christ, whom God represents by the planet Jupiter. It's a good thing all Bob Jones' intercessors waged spiritual warfare in the heavenlies, as he exhorted them, "This high level authority cannot be combated individually but must be engaged through corporate united intercessory prayer." Jones was happy to report in his "Plans and Strategy for Spiritual Warfare in 1999 and 2000" that Basilisk was defeated through their prayers. According to Jones' fellow astrologer in sheep's clothing, Bob Wadsworth, God gave us the planetary alignment of May, 2000 and the Jupiter/Regulus conjunction of 2003 as portents that the Messiah is on His way. In his book, From the Omens of Babylon, Michael Baigent predicted that a conjunction of Jupiter—the King of the planets called the King Star by New Agers—and Regulus, another King Star, would presage the removal of a reigning monarch from power. The Columbia Encyclopedia states that "Regulus is a visual triple star. Its name is Latin for 'prince'." (124:2297) Is it possible that Regulus, as Saturn, is named for the 'prince that shall come' to sign a peace treaty with Israel? If so, this 'prince of the covenant' will fail to deliver on his promises and be overthrown at mid-Tribulation by the Antichrist, i.e., Jupiter advancing on Regulus. In The Secret Architecture of Our Nation's Capital, author David Ovason stated that Regulus means 'little ruler' and that this 1st magnitude star was the 'guiding star' of Rome. It will be seen in the course of the Tribulation events that Saturn and Jupiter are astrological representations of the Roman Pope and the Merovingian Antichrist respectively. The infiltration of the Vatican early on by the Merovingian dynasty has been previously documented and many of the popes have been agents of the Merovingians, including John XXIII and John-Paul II. And there came one of the seven angels which had the seven vials, and talked with me, saying unto me, Come hither; I will shew unto thee the judgment of the great whore that sitteth upon many waters: With whom the kings of the earth have committed fornication, and the inhabitants of the earth have been made drunk with the wine of her fornication. So he carried me away in the spirit into the wilderness: and I saw a woman sit upon a scarlet coloured beast, full of names of blasphemy, having seven heads and ten horns. And the woman was arrayed in purple and scarlet colour, and decked with gold and precious stones and pearls, having a golden cup in her hand full of abominations and filthiness of her fornication: And upon her forehead was a name written, MYSTERY, BABYLON THE GREAT, THE MOTHER OF HARLOTS AND ABOMINATIONS OF THE EARTH. And I saw the woman drunken with the blood of the saints, and with the blood of the martyrs of Jesus: and when I saw her, I wondered with great admiration. And the angel said unto me, Wherefore didst thou marvel? I will tell thee the mystery of the woman, and of the beast that carrieth her, which hath the seven heads and ten horns. The beast that thou sawest was, and is not; and shall ascend out of the bottomless pit, and go into perdition: and they that dwell on the earth shall wonder, whose names were not written in the book of life from the foundation of the world, when they behold the beast that was, and is not, and yet is. And here is the mind which hath wisdom. The seven heads are seven mountains, on which the woman sitteth. And there are seven kings: five are fallen, and one is, and the other is not yet come; and when he cometh, he must continue a short space. And the beast that was, and is not, even he is the eighth, and is of the seven, and goeth into perdition. And the ten horns which thou sawest are ten kings, which have received no kingdom as yet; but receive power as kings one hour with the beast. These have one mind, and shall give their power and strength unto the beast. These shall make war with the Lamb, and the Lamb shall overcome them: for he is Lord of lords, and King of kings: and they that are with him are called, and chosen, and faithful. And he saith unto me, The waters which thou sawest, where the whore sitteth, are peoples, and multitudes, and nations, and tongues. Then shall commence the Great Tribulation—the reign of terror of the Beast. The New Age plans for mankind to go 'back to the future' to the astrological Age of Leo, which The Message of the Sphinx locates as beginning in 10,500 B.C. In the Egyptian Calendar Year of the Ages of the Zodiac, the First Age was the astrological Age of Leo. The preeminence of Leo would seem to conflict with the commonly held New Age belief that the most primitive eon was the Age of Virgo, when the Great Mother Goddess ruled over the Motherland of MU. Recall that the inhabitants of Lemuria, which supposedly existed 18 million years ago, were the ascended race of Great Initiates from the star system Sirius who left their utopian realm to undertake a sacrificial mission to our solar system. A Masonic website, Ancient Egyptians and the Constellations, explains the discrepancy in the Great Calendar Year from the vantage point of the Egyptians, who worshipped the male creator-god, Hu, instead of Mu, aka Nut, the mother of Isis and Osiris. A New Age website explains the progression from the Age of Leo to the present threshold of the Age of Aquarius as the downward spiral from female to male dominance. Aquarius will be the turning point during which the human race will begin to reverse the male dominated social order and ascend toward another Golden Age of Virgo, 13,000 years in the future.